Here’s something I just realized: since going vegan almost three years ago, my holiday meals have been fantastic. Yes, I have played an active role in shopping and cooking to make sure I have something to eat besides lettuce and carrots. But family and friends have been more than willing to make vegan versions of traditional holiday staples and eat the dishes I’ve cooked. The transition to a mixed table (for omnivores and vegans) has been surprisingly painless. The few harmless jokes made about my eating habits have been far outweighed by lively discussions about the health and environmental benefits of a plant-based food system. People seem curious, not threatened. In fact, my sister recently decided to become vegan due, in part, to these discussions. Just as important, if not more so, people really like the food my girlfriend and I prepare for holiday meals, like our amazing mac and cheese, animal-free stuffing, and sweet potato pie. So, since this is the season of giving, I’m sharing the most successful dishes we’ve ever served to our meat-loving relatives. Enjoy! No it isn't cheese... even though it may look like it. Photo credit: Vegan Yumminess. This is the hands-down favorite of everyone who’s ever invited us to a holiday meal. We usually set it out without telling anyone it’s vegan and people rave about it. More than one cheese-loving guest has said it’s the best mac and cheese they’ve ever had. When we tell them the sauce is made mostly of vegetables, they’re dumbfounded. 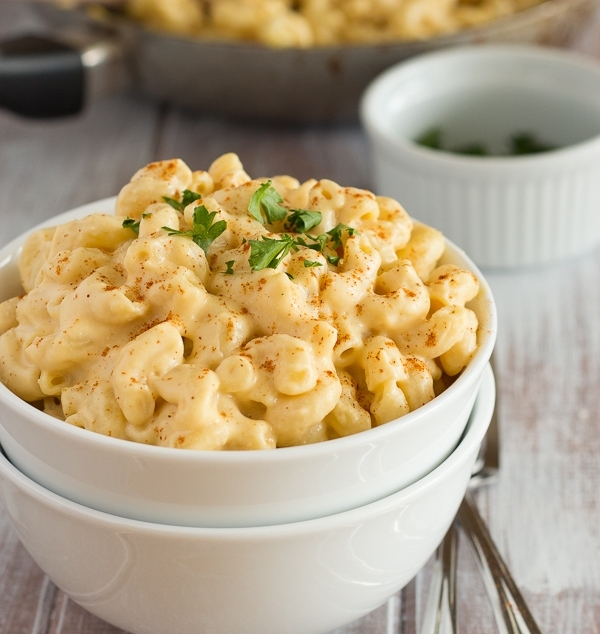 “Wait, what?” The funny thing is, mac and cheese was never a holiday side dish in either of our households, but this vegan version has quickly become a standby. Stuffing that's practically a meal in itself. Photo credit: Food52. A colorful dish flavored with balsamic vinegar. Photo credit: Simple Vegan Blog. This year at Thanksgiving, we roasted sweet potatoes, onions, mushrooms, peppers, and broccoli, but this recipe is so versatile you can use whatever veggies you have. Winter squash is a great seasonal addition to the mix. Every time I think I’ll be the only one who eats this dish, I’m left competing for the remains. Try this six-ingredient mash. It's creamy, buttery, fluffy and nicely spiced with roasted garlic and chives. Photo credit: Minimalist Baker. Like stuffing, mashed potatoes are a classic that even traditionalists can make vegan without trying too hard. You don’t even really need a vegan-specific recipe. Just substitute non-dairy milk and non-dairy butter in your family’s normal recipe. I can guarantee nobody will notice the difference. My mom and sister are both lactose-intolerant so using non-dairy ingredients is already the norm in our house. All three of us are now plant-based eaters (my dad is the lone holdout) but the mashed potato recipe hasn’t changed one bit. Who needs pumpkin, anyway? This sweet potato pie is naturally sweet so requires less sugar. Photo credit: Nate Lotze. I didn’t know sweet potatoes could be a pie filling until I lived in North Carolina. At the farm where I worked, we celebrated the sweet potato harvest with a pie-making contest. Since then, sweet potato pies have become my go-to holiday dessert. Personally, I think sweet potato is tastier than pumpkin because it's naturally sweeter, not nearly as bitter. For the crust, I use the Crisco recipe my mom has been following since before I was born. It turns out she was making vegan pie crust all those years without even realizing it. I’ve only gotten negative feedback on a sweet potato pie once. In 2015, one of my girlfriend’s aunts took a bite and spat it out. I was worried until she said she hates sweet potatoes. (Then why did you eat it?) Everyone else has been a fan. Try it for yourself!